I hope you had a safe and enjoyable Halloween. If you are finding yourself (or your child) with a bag full of candy they can't eat. Here's an easy recipe from Learning to Bake Allergen-Free. Use these treats to swap for Halloween candy that your child might not be able to eat. It can be difficult to find a chocolate bar that is made without milk (or traces of milk and nuts). This chocolate crisp is a make-your-own candy bar that can be prepared in minutes, without turning the oven on. Use your favorite non-dairy chocolate, or try this with different chocolates to see which you prefer. 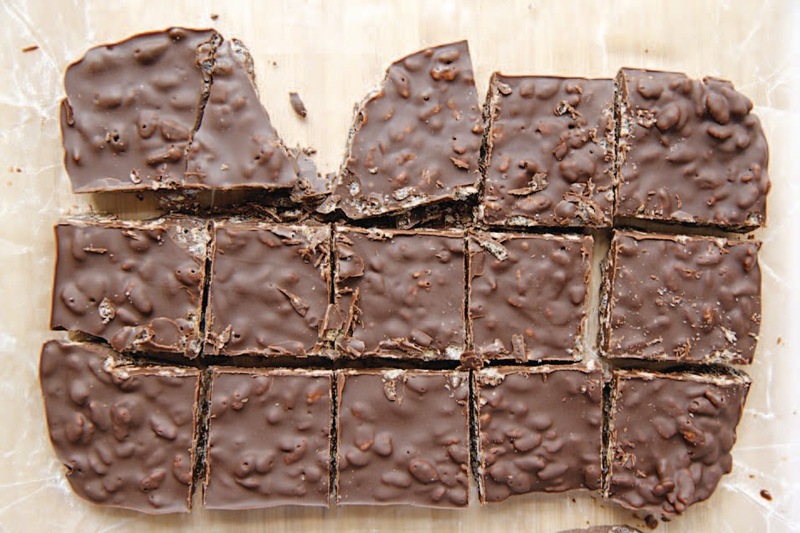 For a special treat, spread a layer of sunflower seed butter (available at the grocery store) between two pieces of chocolate crisp. Yum! 1. Line a 9-inch square pan with wax paper. 2. Melt the shortening in a medium saucepan over medium-low heat. 3. Add the chocolate chips and use a spoon to stir continuously while melting. 4. When the mixture is completely melted, remove the pan from the heat. Let it cool for 5 minutes. 5. Fold in the rice cereal. 6. While still warm, spread the mixture in the lined pan. 7. Refrigerate for at least 2 hours. The chocolate will harden. 8. Use the wax paper to lift the chocolate block from the baking dish. Cut or break the crisp into desired-size chunks and serve. • My favorite crisped rice cereal is Erewhon Gluten Free Crispy Brown Rice cereal. It contains just three ingredients: organic brown rice, organic brown rice syrup, and sea salt. • Be careful not to let the chocolate burn while it is melting. Stir continuously and keep the heat low.